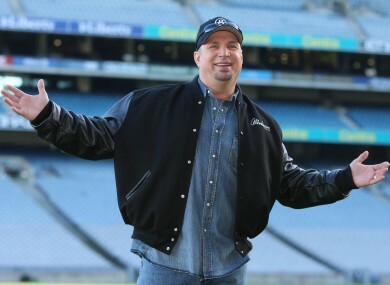 Garth Brooks at Croke Park stadium during an announcement about his concerts. DUBLIN CITY COUNCILLORS have called for a public hearing into licences for five Garth Brooks concerts to be held in Croke Park this July. Residents have been up in arms over the concerts as they say there was an agreement with the management at Croke Park that the venue would only host three concerts this summer. The council has the authority to refuse to grant licences for the concerts and an emergency motion put forward by Independent councillor Michael Ring last night called for a public hearing to be held on this. Labour’s Andrew Montague supported the motion, commenting at the meeting last night that management should honour their agreement with the community. The bottom line is there was an agreement between Croke Park and the residents and Croke Park are now breaking that agreement and I don’t think they should be rewarded for, you know, walking all over the residents in this way when an agreement is made it should be stuck with. Ruairí McGinley pointed out that the promoters have already sold all of the tickets for the concert and said there was a need to change legislation to prevent people selling tickets for unapproved concerts. Fianna Fáil’s Paul McAuliffe said the fact that tickets have been sold already should not mean licences are automatically granted. If we had a builder that sold nine houses without planning permission would we say that the sale has to go ahead regardless? We would not. His party colleague Mary Fitzpatrick said it was “hugely disappointing” that this row has been going on for a least ten years now. “I’m not a fan of Garth Brooks, but those who are are entitled to it and…” she told the meeting before the room erupted into laughter. She added that it was the role of the council to support the local community and its needs. Assistant manager of the council, Philip Maguire said an application for the licences is due in May and a five week public consultation would follow before any meeting to consider an event plan. He told councillors there would be an opportunity to request an oral hearing at that stage. Email “'I'm not a fan of Garth Brooks' - Councillors call for public hearing on concert licences”. Feedback on “'I'm not a fan of Garth Brooks' - Councillors call for public hearing on concert licences”.